Placing an order with us couldn’t be simpler, we'll keep you up-to-date every step of the way. ...and we never print a job until you have signed off your proof! Let us know how & where the print will be used. This will determine if print needs special properties e.g. tear proof, scratch resistant. If you don’t have print ready artwork you will need this creating. Print ready artwork = Print Ready PDF, QuarkXpress, Adobe Indesign or Adobe Illustrator file. print materials and finishes for you to view before making a decision. We will provide you with a quote. 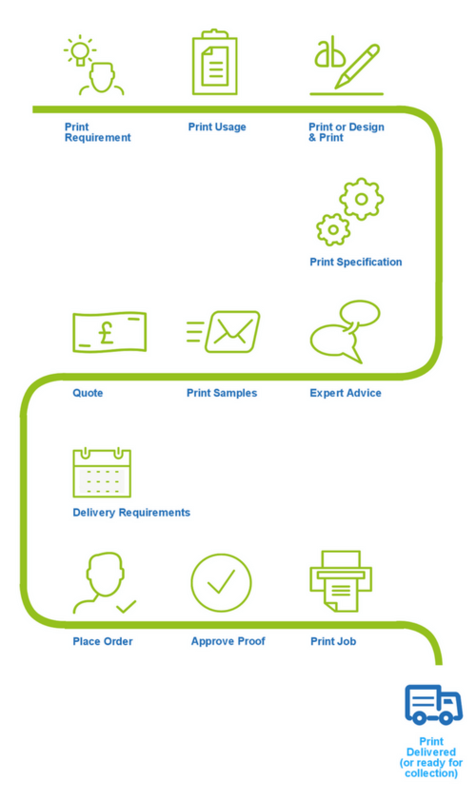 This quote may provide multiple options, simply select your preferred print quantity or specification. Standard delivery is with 10 working days. If you require an Express Delivery discuss this with us (additional charges may apply). If you are happy with the quote simply accept it using our online system or by email. You will receive an email confirming your order which will also include an estimated delivery date. You will receive a proof via email, please check this thoroughly and either accept the proof or submit/request alterations. We will process and print your job. If your order is being delivered you will receive an email containing tracking information.